Hask Greek Yogurt Repairing Blueberry & Acai Collection Review! 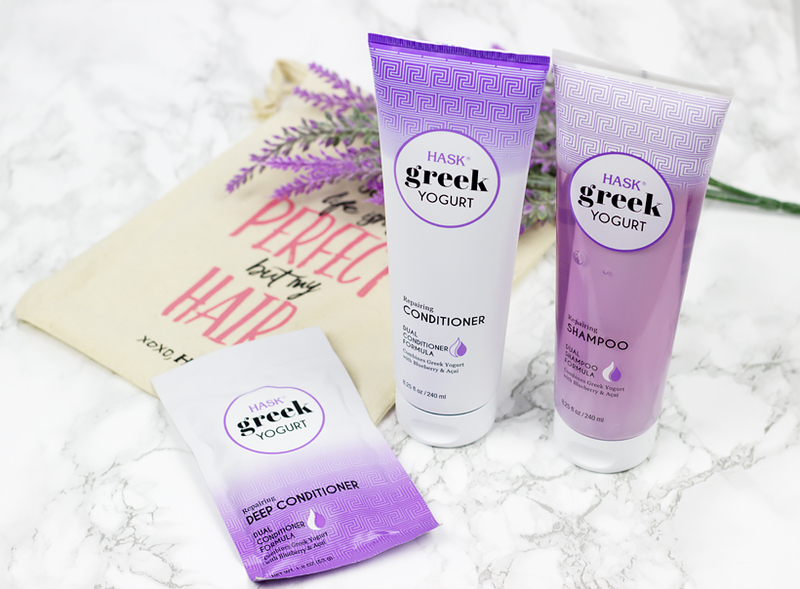 Hask new Greek Yogurt line of haircare products completely surprised me and since I love using yogurt in the kitchen as well as in the DIY beauty recipes, I was super excited to give it a try and see how it will work on my hair. As many of us know greek yogurt is packed with calcium, potassium, and different vitamins which in this case help nourish and moisturize the hair. 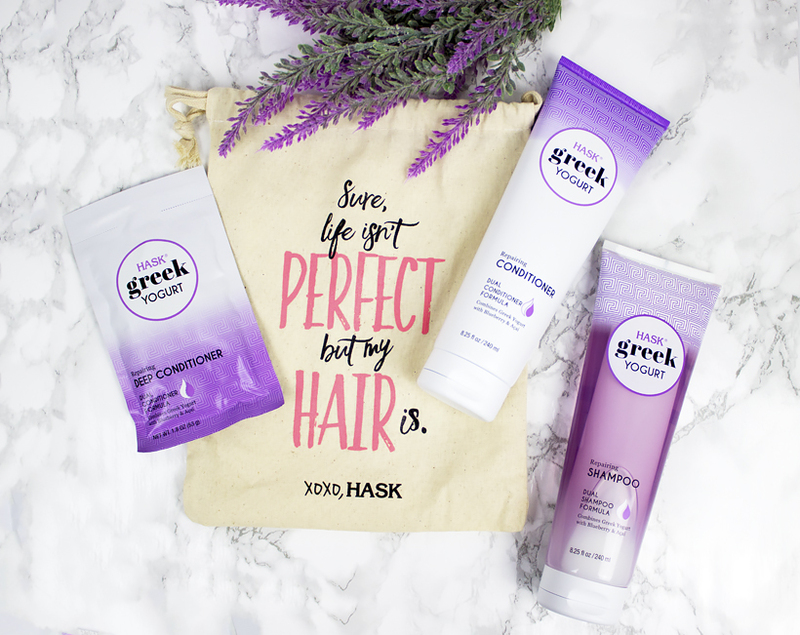 I was also happy to find out that the entire Hask Greek Yogurt collection is free of sulfates, parabens, phthalates, gluten and drying alcohol. Since I've been doing some damaging hair coloring on my hair since a good two or more years now I picked the Blueberry & Acai Repairing line, but Hask also offers their Greek Yogurt in two other collections which are Hydrating (with fig and honey extracts) as well as Color Protection (which is made with Cranberry and Pomegranate extracts). The one thing that I found super interesting is Hask Greek Yogurt dual formula using the Dual-Chamber Dispensing System. Basically when you squeeze the product out there is the greek yogurt part (white) which nourishes hair as well as the fruit extract part (clear with a tint of purple) which provides hair with vitamins and antioxidants. I am not going to lie, I personally think it looks pretty cool. 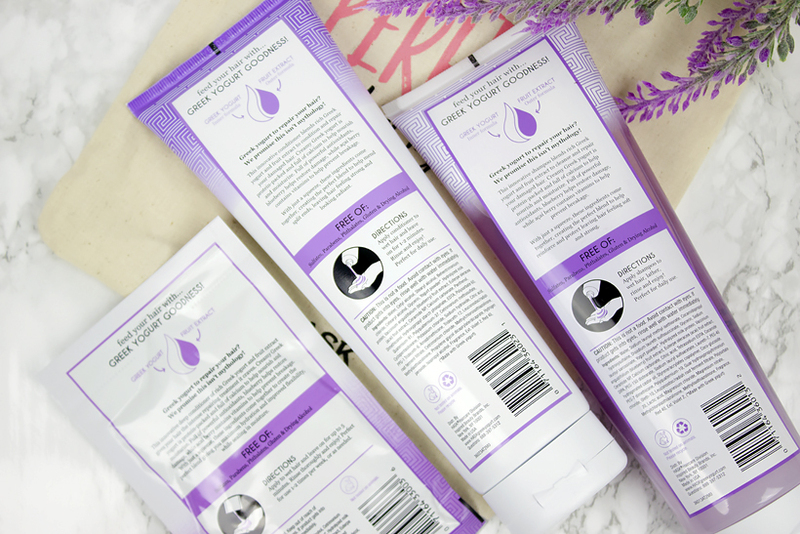 If you read my blog regularly, you know how obsessed I am with good smelling hair care and Blueberry & Acai Repairing line smells absolutely divine! Subtle, refreshing just perfect! My hair felt very soft and hydrated after using this line for a couple of weeks now. I absolutely love the dual formula idea and the entire Hask Greek Yogurt Repairing line smells absolutely delicious! I also love the fact that this line is sulfate and paraben free. Hask new Greek Yogurt Collections ($9.99 each product) are available exclusively at your local Walgreens as well as online on Walgreens website!